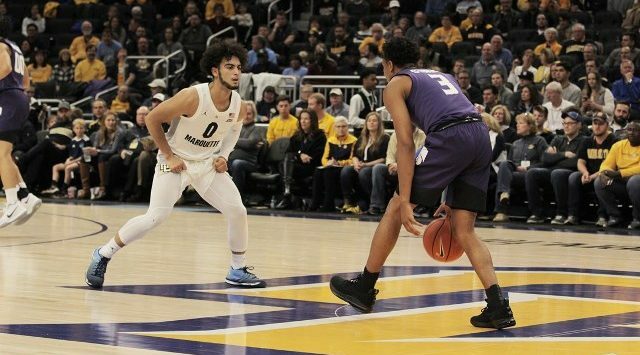 MILWAUKEE, Wis. – On the strength of a season-high 45 points from junior Markus Howard, Marquette knocked No. 12/10 Kansas State from the ranks of the unbeaten with an 83-71 victory on Saturday afternoon in front of 15,517 fans at Fiserv Forum. The 45 points by Howard were the second-most surrendered to a single opponent in school history and the most since Siena’s Doremus Bennerman went for school-record 51 points in the consolation game of the NIT on March 30, 1994. The junior connected on 11-of-17 from the field, including 4-of-10 from 3-point range, and hit on 19-of-21 attempts from the free throw line. It marked his second game of 35 or more points this season. Marquette (6-2) connected on 56.8 percent (25-of-44) from the field, including 68.4 percent (13-of-19) in a pivotal first half, in which, the Golden Eagles used a key technical on senior Barry Brown, Jr., to ignite a 10-0 run by Howard that gave them the lead for good. K-State (6-1) would get no closer than seven points the rest of the way. For a Wildcat squad that entered the game seventh nationally in scoring defense (56.3 ppg.) and 28th in field goal percentage defense (37.7), the 83 points and 56.8 field goal percentage were the most allowed this season. including 34.6 percent (9-of-26) in the first half when the Wildcats missed 12 of their last 16 shots. Junior Makol Mawien and Xavier Sneed led four players in double figures with a team-high 12 points, while seniors Dean Wade and Kamau Stokes finished with 11 and 10 points, respectively. Howard was joined in double figures by Anim Sacar, who finished with 16 points on 7-of-12 field goals. In tightly-called contest, the teams combined for 53 personal fouls, including season-high 29 on K-State. K-State got off to a solid start in its first true road trip, scoring the opening basket on a pass from Wade to Sneed, who finished at the basket. Throughout the first five minutes of play, the Wildcats outscored the Golden Eagles 9-6, including 4 points from Mawien. Minutes later, Marquette would draw the score even for the first time at 12-12 when Howard connected on a jump shot with 12:50 left in the half. Both teams then traded 3-pointers on consecutive possessions, including a trey from sophomore guard Cartier Diarra, to tie the game at 15-all at the second media timeout. Marquette found its first lead when Brown got called for a personal and technical foul, sending Howard to the line for four free throws, where he connected on all of them to give the Golden Eagles the lead at 21-20 with 8:31 left in the first half. Howard’s four free throws started a personal 10-0 run, as the Golden Eagles extended the lead to 27-20 lead with 6:35 to go in the half. Marquette would take a 44-33 lead in halftime, 26 of which came from Howard, who finished 6-of-7 from the field, including 3-of-4 from 3-point range, and 11-of-12 from the free throw line. The Golden Eagles connected on 68.4 percent (13-of-19) in the first half compared to just 34.6 percent (9-of-26) from the Wildcats. In the second half, K-State came out attacking, forcing two-straight turnovers on defense, leading to a 6-0 K-State run to trim the score to 44-37 just 1:14 into the second half. After a quick timeout by Marquette, the Golden Eagles would score eight consecutive points to push the lead back into double digits at 49-37 with 17:35 remaining. K-State would close the gap to 10 points on three different occasions down the stretch, including 73-63 with 5:36 to play, but could get no closer in dropping their first contest of the season. The Golden Eagles finished at 56.8 percent (25-of-44) from the field, including 48 percent (12-of-25) in the second half, while the Wildcats shot 41.8 percent (23-of-55), including 48.3 percent (14-of-29) after halftime. Howard had 19 points in the second half on 5-of-10 shooting and 8-of-9 from the line to finish with 45. Sneed scored 10 of his team-tying 12 points in the second half on 3-of-4 field goals. Junior Xavier Sneed tied a team-high with 12 points on 4-of-5 shooting from the floor on Saturday, while also adding an assist and 3 steals in 23 minutes of play. 45 – Marquette’s Markus Howard scored a season-high 45 points on 11-of-17 field goals and 19-of-21 free throws. The 45 points were the second-most by an opponent in school history and the most since Siena’s Doramus Bennerman scored 51 in the consolation of the NIT on March 30, 1994.